Download "PMP Exam Prep Training - 5 Days"
1 PMP Exam Prep Training - 5 Days (Based on the PMBOK Guide, 5 th Edition) Course Length: 5 Days Course Abstract: This workshop has a primary and a secondary goal. 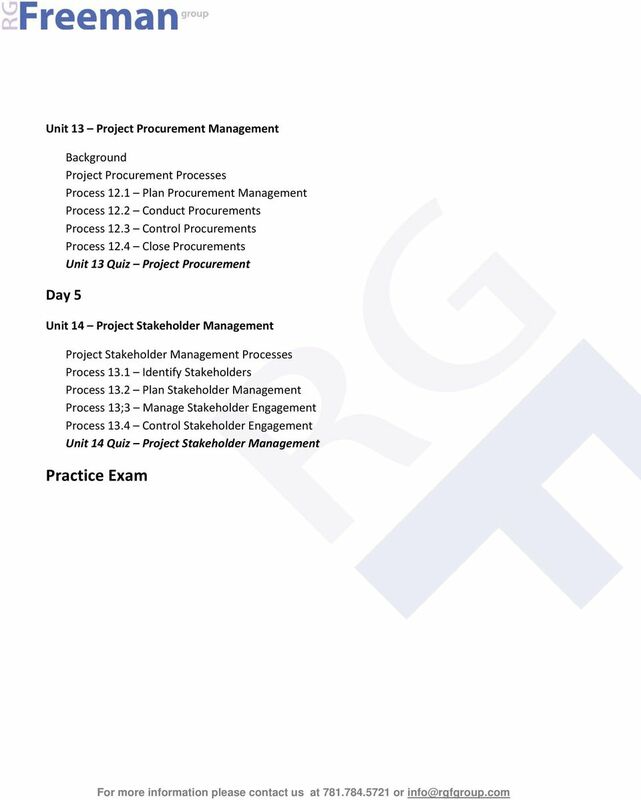 The primary goal is to prepare participants to successfully complete the examination required for earning the Project Management Professional (PMP ) certification. 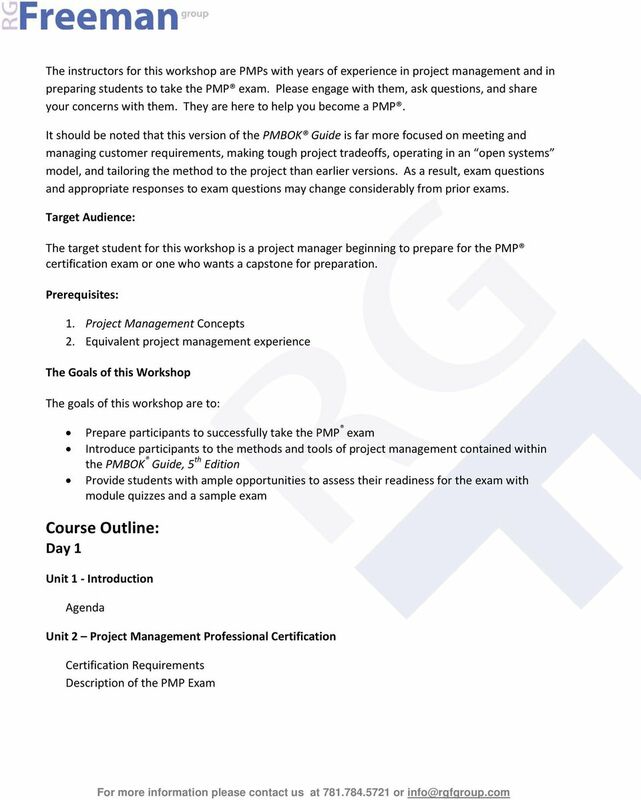 For those who attend the entire workshop, it meets the requirements for the 35 hours of contact education required for registering for the PMP exam. Some participants may use this workshop as the beginning of their preparation and may plan to take the examination at some distant point in the future. Others will use this workshop as a capstone experience and take the examination soon after the workshop. (Some training providers have an audit policy that may allow you to do both.) 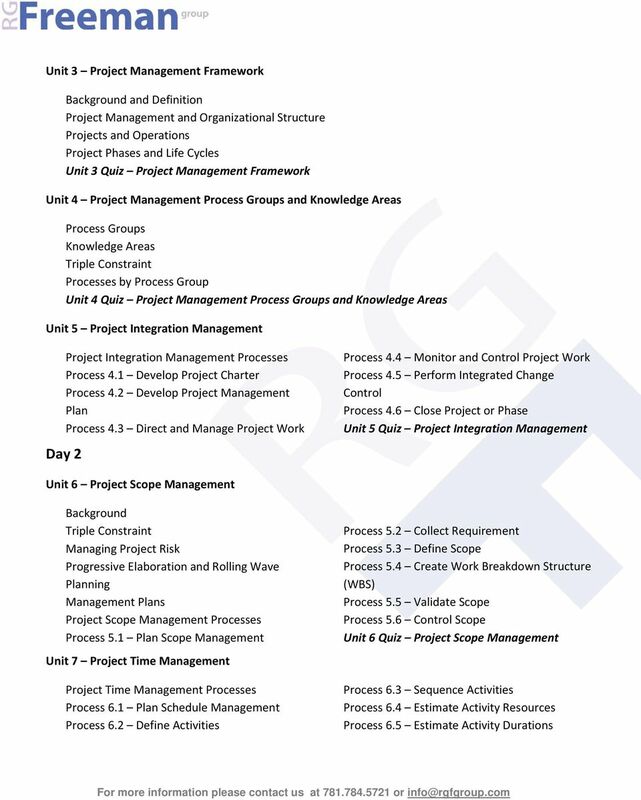 The secondary goal of this workshop is to give participants a rapid, in-depth exposure to the project management processes defined by the PMBOK Guide. The workshop has been designed to work either way. 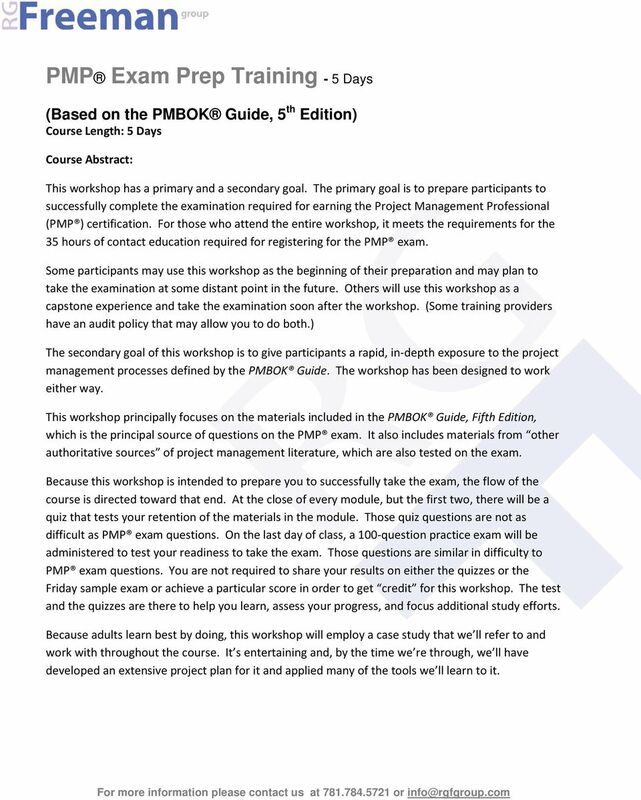 This workshop principally focuses on the materials included in the PMBOK Guide, Fifth Edition, which is the principal source of questions on the PMP exam. 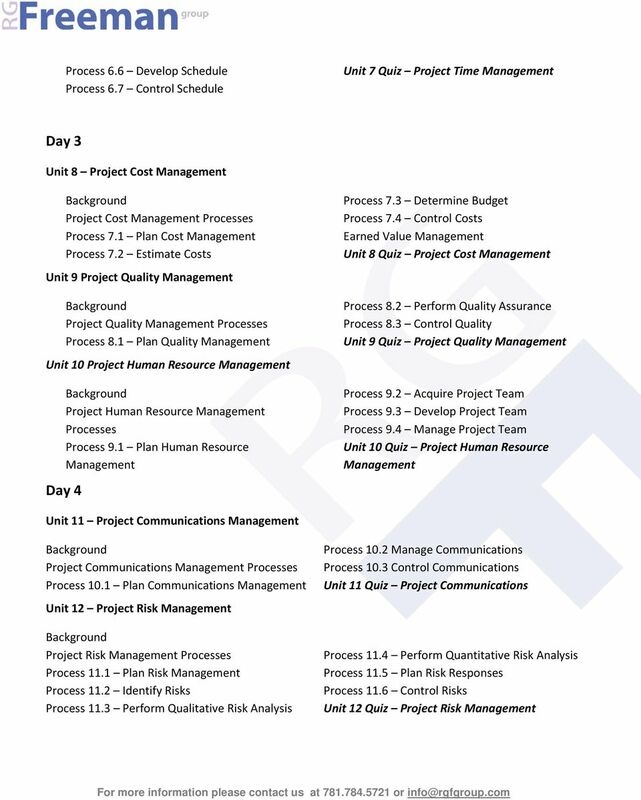 It also includes materials from other authoritative sources of project management literature, which are also tested on the exam. Because this workshop is intended to prepare you to successfully take the exam, the flow of the course is directed toward that end. At the close of every module, but the first two, there will be a quiz that tests your retention of the materials in the module. Those quiz questions are not as difficult as PMP exam questions. On the last day of class, a 100-question practice exam will be administered to test your readiness to take the exam. Those questions are similar in difficulty to PMP exam questions. You are not required to share your results on either the quizzes or the Friday sample exam or achieve a particular score in order to get credit for this workshop. The test and the quizzes are there to help you learn, assess your progress, and focus additional study efforts. Because adults learn best by doing, this workshop will employ a case study that we ll refer to and work with throughout the course. It s entertaining and, by the time we re through, we ll have developed an extensive project plan for it and applied many of the tools we ll learn to it.